Baltimore: John Hopkins University Press, 2005. Winner, 2005 Award for Excellence in Professional and Scholarly Publishing for the best book in Business, Management and Accounting, given by the Association of American Publishing. 1. Lejaren a Hiller advertising montage, 1930s, Visual Studies Workshop. 2. Frank and Lillian Gilbreth film strip of worker motion study, October 2, 1917. 3. 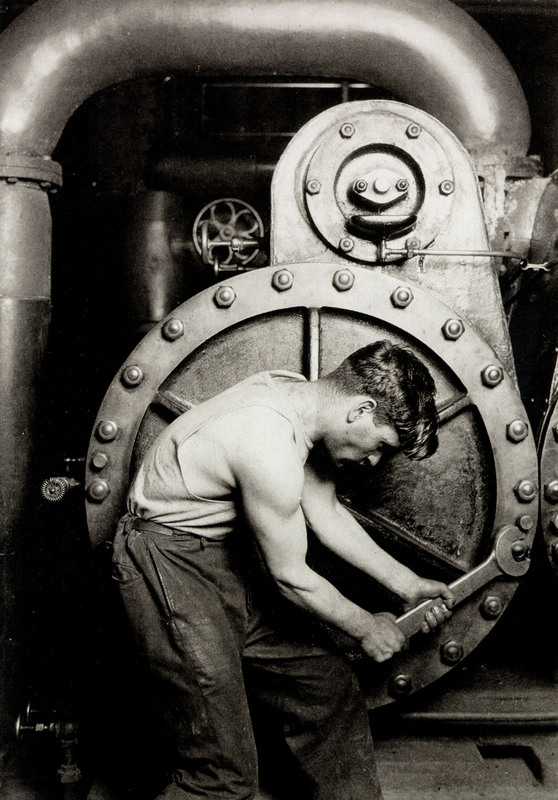 Lewis W. Hine from Powermakers series, 1921. My first monograph examined the intersection of photography as a mass technology with corporate concerns about efficiency in the Progressive period. In the late nineteenth century, corporate managers began to rely on photography for everything from motion studies to employee selection to advertising. This practice gave rise to many features of modern industry familiar to us today: consulting, "scientific" approaches to business practice, illustrated advertising, and the use of applied psychology. I explored these intersections through a variety of examples, including racial discrimination in hiring, the problem of photographic realism, and the gendered assumptions at work in the origins of modern marketing. I argued that the goal uniting the various forms and applications of photographic production in that era was the increased rationalization of the modern economy through a set of interlocking managerial innovations, technologies that sought to redesign not only industrial production but the modern subject as well. The Corporate Eye has been reviewed in several journals, including American Quarterly, Business History Review, Business History, Technology & Culture, Human Resource Management, The Journal of Consumer Culture, and American Studies. It can be accessed via Google books and purchased through John Hopkins University Press.